I like the words of James in the Bible. His concise writing packs a lot of practical teaching into five succinct chapters. In chapter four he opens with a string of negative outcomes that often plague people. He lists fights, quarrels, envy, covetousness, and the kicker of all disappointments: unanswered prayers. Ouch. Why do we suffer from such things? The cause is spiritual adultery, of being so friendly with worldly pursuits that we become estranged from God. Double ouch. God wants our full attention, undivided. What’s the solution? James’s two-part answer, both direct and succinct, says to submit to God and resist the devil. But are these dual initiatives for us to pursue or opposite sides of the same coin? By submitting to God do we automatically become empowered to resist evil? Perhaps by turning our back to sin, we effectively submit to God. Yet it matters not if we resist first, submit first, or do both. The main thrust of James’s instruction is to effectively focus our actions on God and turn from worldly pursuits. How do we do this submitting to God and resisting the devil? James says we need to be close to God, wash our hands (figuratively speaking), purify our hearts, repent (grieve, mourn, and wail), and humbly approach God. Then he will lift us up. Implicitly our disagreements will cease, our materialism will end, and we will enjoy answered prayer. 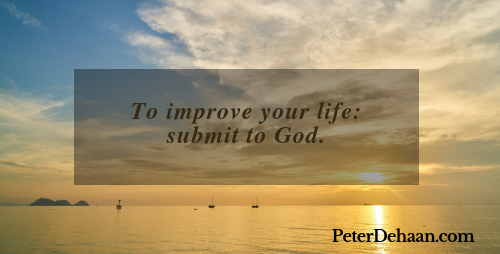 It starts when we submit to God and resist temptation.